By including open source technologies in the heart of a robot, you can quickly enhance its capabilities and make it more… clever. Robots start to be able to recognize their environment and directly work with people by adapting their trajectories themselves. Open source coding has allowed robots to become safer by being more aware of and responsive to their environments. This feature is what enables them to work alongside humans so effectively. Previous generation of robotic technology require safety cages to prevent humans from getting in the way of moving robotic arms and parts, making them a better fit for large-scale heavy manufacturing. Cobots, however, allow smaller scale, human-driven manufacturing work to benefit from the increased efficiency offered by automation. One of the primary motivating factors for integrating robotics into the manufacturing workforce is to prevent businesses from incurring fines, medical costs, and higher insurance premiums as a result of ergonomically problematic manufacturing practices. Often, monotonous, repeated tasks can cause musculoskeletal injuries to a human workforce over time, which not only costs businesses hundreds of thousands of dollars, such health problems diminish the productivity of the workforce and increase employee turnover. Integrating cobots into a human workforce diminishes musculoskeletal injuries on the job, and allows employees to work at a company longer without risking their health and safety. Integrating robotics into a human workforce is both a realistic goal, and a cost-effective one. Cobots are proving to manufacturers that using robotics to augment rather than replace a workforce is tremendously advantageous to their rate of output. Not only do these easy-to-program robots reduce the time it takes for them to learn a new task, they enhance the productivity of the humans working around them. Their easy-to-code, environmentally responsive features also make them relatively simple for employees to operate and manipulate without the aid of computer engineers, which reduces work stoppage and downtime. Between reduced insurance premiums, lower healthcare costs, and improved workplace performance there are significant, quantifiable benefits to using cobots in a variety of manufacturing applications that directly impact budgets and profit margins. For that reason, automators and robotics engineers aren’t the only ones who should be getting excited about cobots and their potential for revolutionizing modern manufacturing. 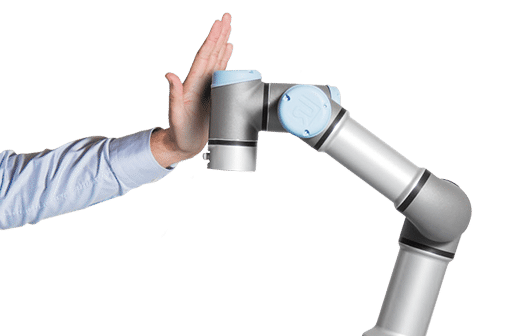 If you’re interested in learning more about how to integrate cobots into your operation, connect with one of our automation experts via the chat window or Contact portal on our web site.